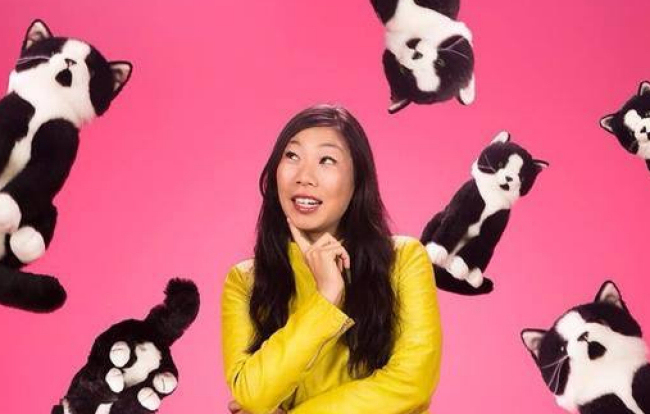 Kristina Wong (@mskristinawong) has dedicated her life to holding up a mirror to Asian America’s politics, pride and foibles through her work as our community’s foremost contemporary performance artist. Wong has influenced generations of Asian American activists with the range of her work tackling such weighty issues as mental health (in her one-woman show “Wong Flew Over the Cuckoo’s Nest“) and celebrity obsession (in her ongoing performance piece wherein she appears at public events with hopes of marrying Jeremy Lin). Wong’s latest show “Wong Street Journal” has its world premiere this week June 17-June 21 in San Francisco as part of the United States of Asian America Festival (link contains full schedule of festival events) hosted by Asian Pacific Islander Cultural Center (APICC): tickets are still available here. As someone who tries and fails to be even a fraction as funny as Kristina, I’m always in awe of her work, which is simultaneously hilarious and deeply thought-provoking. I had a chance last week to interview Kristina and learn a little bit about what it takes to “act up” and “act out” from one of my long-standing Asian American feminist sheroes. When’s the wedding to Jeremy Lin and am I invited? It takes money to marry money. And sadly: Right now, I have not been able to raise the money to get his attention. Last summer, I tried to raise $5400 on Kickstarter for courtside tickets where I’d show up in a wedding dress, and he would propose on the spot (because how could he resist?). I came up $394 short after a grueling month of cyber beggary and still have no wedding date. I wake up almost every day wishing I lived in California — and not just because of the sun (and the drought) — but also because it is one of the few beating hearts of AAPI cultural and political life; I’m always bummed when I find out about an awesome event or exhibit that I can’t attend because I live elsewhere in the country. One such event is Hungry Ghosts, the latest art exhibit by the Asian American Women’s Artists Association (AAWAA), a 25-year-old non-profit organization dedicated to advancing the work of Asian American women artists. 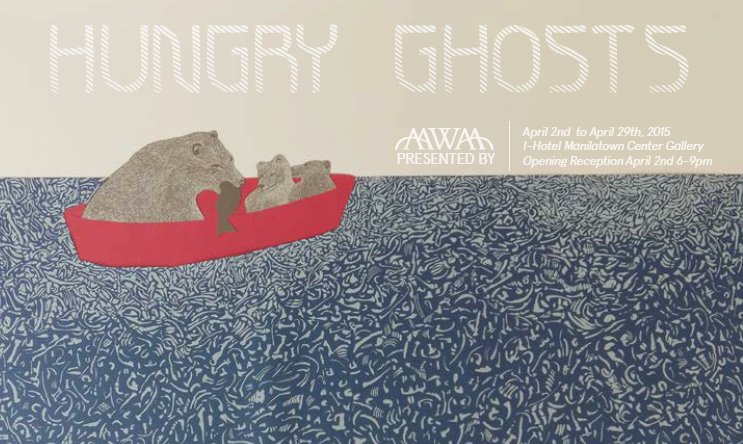 Hungry Ghosts opens tomorrow (April 2nd) in San Francisco in partnership with the Asian Pacific Islander Cultural Center (APICC) and Manilatown Heritage Foundation. Hungry Ghosts will feature AAPI artists using art to explore “personal and collective struggles”, and how these unconfronted traumas can emerge in the public consciousness in often damaging ways.